The most common materials used for cladding on modern commercial developments are steel, stainless steel and aluminium. Stainless steel, of course, has been used extensively in architectural design for decades, principally because of its combined benefits of corrosion resistance and appealing aesthetics. Though architectural styles change, the enduring appeal of the silvery-grey matt, brushed or polished stainless steel finish endures. When stainless steel is used as a cladding material it will stay looking as good as the day it was installed, without the need for ongoing maintenance. It is these benefits that are driving innovation and as a result stainless steel cladding is now available in a much wider range of patterns and textures, alongside the classic polished, brushed, blasted and etched finishes. The corrosion resistant properties of stainless steel are well known and arise due to its self-repair mechanism. This means that even if the material is scratched, cut or drilled, its natural, passive, transparent oxide layer instantly reforms to prevent rust or corrosion. This makes it an ideal material in a 316 grade for an external façade environment. An exciting area of stainless steel development has been in coloured finishes, which involves immersing the stainless steel in a hot mixture of chromic and sulphuric solutions. This increases the thickness of the oxide layer, meaning a tough, durable, maintenance-free facade. The oxide layer also creates light interference, or what is commonly known as ‘splitting’ of white light, giving the stainless steel the impression of colour. It is worth remembering that this colour isn’t painted onto the stainless steel but is the integral oxide layer that forms on the stainless steel when it is immersed in the hot mixture. This process has created a step change in choice when it comes to stainless steel cladding and the single factor that stands out is that the colour isn’t applied to the surface like a painted cladding panel, but is an integral part of the material. It is the thickness of the oxide layer – perfected by Rimex – that creates the surface colour. That, combined with the inherent corrosion resistance of stainless steel as well as the self-repair benefits of the coloured finish makes it the stand out choice for modern rainscreen façades. The range of colours available using this process, in order, are Champagne, bronze, gold, rosy gold, blue and black. In addition, different tones of colour on a cladding panel can be achieved by altering the finish of the material prior to colouring. For example, using a satin finish will produce a different affect than say a mirrored finish. Other affects can also be produced by combining the ColourTex range with one of the many textured patterns in the Rimex 3 dimensional range or the MetalArt process. We are able to manufacture complete rainscreen facades or feature cladding with many of these options. As the process does not involve any paint, pigment or dyes the stainless steel ColourTex range is impervious to ultra violet light and therefore completely colourfast, making them ideal for rainscreen façade and cladding panels. As the colour process produces what is known as a living colour, different tones will be seen when looking from different angles. Plus, different batches of material may result in a slightly different colour and so it is important that cladding for the whole project is ordered from one batch of material. Our ColourTex stainless steel cladding can be combined with the substrate finishes of mirror or satin polishes, GRANEX™ bead blast or with Rimex’s other product lines of Patterned or MetalArt™ finishes. If you are trying to achieve a specific aesthetic on a façade or cladding we can help you identify a solution – take a look at our case studies for ideas or call us on 0151 545 5075. For instance, we recently supplied Rimex ColourTex Pyramid Black stainless steel cladding to the University of Central Lancashire’s (UCLan) ‘social spaces’, a new building that aims to encourage students to stay longer on its Preston campus. The ColourTex stainless steel Pyramid Black was specified by AHR architects for the front low level aspects because it creates a tough, impact resistant surface. The pyramid patterned finish also hides scratches, dents and other impact damage, making it ideal for high traffic areas. The three-dimensional pyramid pattern gives the black added depth and texture. The ColourTex materials was specified on our Proteus HR honeycomb panel system. This is a sandwich cladding panel with a linked geometric honeycomb core structurally bonded to the ColourTex outer skins. The result is a cladding panel with high bending stiffness and overall low density. 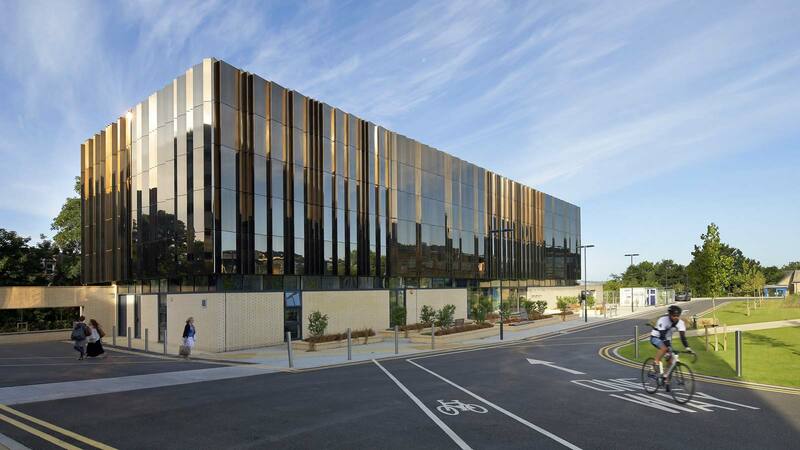 The façade was installed by Preston-based Architectural Glazing & Facades. 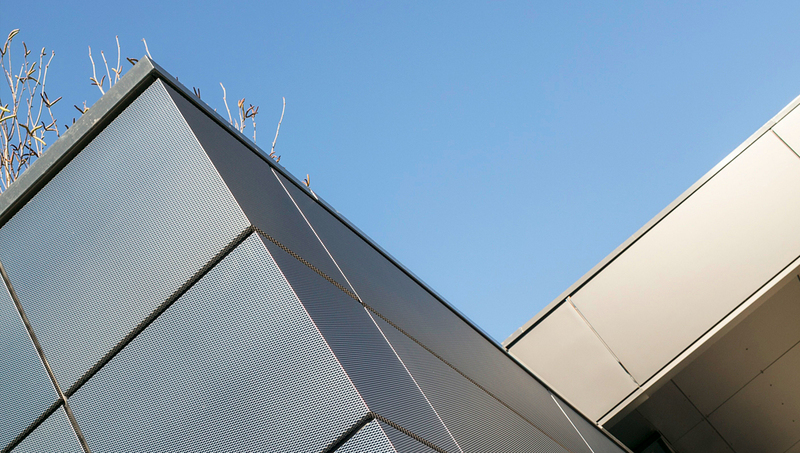 It’s also worth bearing in mind that stainless steel, due to its mechanical yield and strength, is a good choice if you are seeking larger cladding panels, which can be very effective on a building façade. 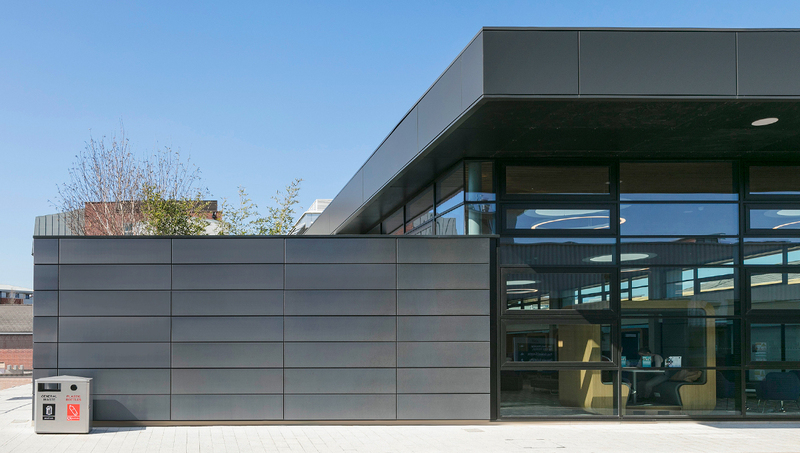 The lightweight, strong properties of our Proteus HR honeycomb core cladding panels makes it an ideal choice for creating these visually stunning rainscreen facades. Discover more case studies from Proteus on our website.